Journalists are broke or going out of business. Propaganda doesn’t pay too bad. She makes $7,000,000 a year. She understands the marketplace. Establish your territory and exploit it. Peter- Thank you for a very compelling observation about Maddow’s desperate need for acclaim. It IS sad. 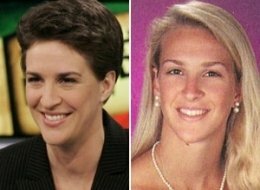 Tens millions of Maddow worshippers will be out to punish you for exposing their Joan of Arc as clueless and needy therefore dangerous. Well, I guess I am just an old” fuddy duddy”. I just became bored by Rachel’s dodging all of the real issues facing our country because of the failure of both parties and the feckless American citizenry to recognize Trump’s incipient but quite apparent similarity to Il Duce. I found her breathless reporting of the very small details of Trumps romance ( (as a serial philanderer himself) with Putin and all the other aspiring dictators, while avoiding using the term “Dictator in waiting” , a bit of protecting her territory as an “accepted”” mainline talking head. Since giving upon Rachel because of boredom have found Erin Burnett on CNN, although quite infuriated at times with her right wing guests,she is quite entertaining with the tantalizing one inch of cleavage she’s shows every evening during her stint . Keeps the old blood moving. No boredom there. The only thing we have to fear is fear itself, but it always gets great ratings. Fake news: Maddox nightly audience is a little over 2 million. Hannity beats her ratings most nights. WWE beats them both. All three encourage violence as a final solution. In the case of WWE, it’s the wrestlers that are dying young. In the case of the propaganda networks, it’s our democracy. How do we defeat it? Violence ain’t the answer. The dumbocratic-repugnican warfare corporate state seeks to make us afraid in order to maintain its control over the economic, political and military institutions. It needs mortal enemies, manufactured or real, at home or abroad, to justify its existence and mask its mismanagement and corruption. It is not about making us safe, but like the Nazis,it is about getting us to surrender to the will of the elites. The more inequality and injustice grow, the more the fear doctrine will be used to keep us cowed and compliant. The doctrine means that the enemies of the United States will never be destroyed, but will mutate and expand; they are too useful to be allowed to disappear. It means that the primary language of the state will be fear. The longer the national security state plays this game, the more a fascist America is assured. When the Assanges and Snowdens are the enemy and the Cheneys and the ilk are free to spread their venom, we are one Reichstag fire away from our demise. And you can bet Fox and MSNBC will be cheering when it does. Think of the shock and awe ratings. Of course, the only way to defeat shock and awe is with another shock and awe. I don’t see an end to the Inquisition into Trump (no, I didn’t vote for him nor would I ever vote for him). Barr’s report will show that career federal employment is far from partisan. I do pity Mueller since his research must have led him to existential heartbreak. Barr’s horror at the intelligence community spying on Trumpie was Hillarious. If it is any consolation, Snowden let US know we are all being watched.